Two-dimensional (2-D) transition metal dichalcogenides (TMDs) nanomaterials such as molybdenite (MoS2), which possess a similar structure as graphene, have been donned the materials of the future for their wide range of potential applications in biomedicine, sensors, catalysts, photodetectors and energy storage devices. 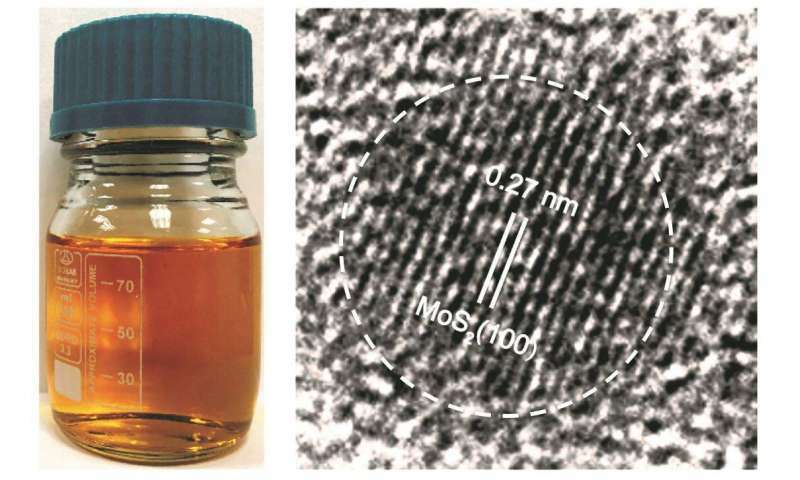 The smaller counterpart of 2-D TMDs, also known as TMD quantum dots (QDs) further accentuate the optical and electronic properties of TMDs, and are highly exploitable for catalytic and biomedical applications. However, TMD QDs is hardly used in applications as the synthesis of TMD QDs remains challenging. Associate Professor David Leong from the Department of Chemical and Biomolecular Engineering at NUS Faculty of Engineering led the development of this new synthesis method. He explained, "Using the bottom-up approach to synthesise TMD QDs is like constructing a building from scratch using concrete, steel and glass component; it gives us full control over the design and features of the building. Similarly, this bottom-up approach allows us to vary the ratio of transition metal ions and chalcogen ions in the reaction to synthesise the TMD QDs with the properties we desire. In addition, through our bottom-up approach, we are able to synthesise new TMD QDs that are not found naturally. They may have new properties that can lead to newer applications." "Photodynamic therapy currently utilises photosensitive organic compounds that produce oxidative stress to kill cancer cells. These organic compounds can remain in the body for a few days and patients receiving this kind of photodynamic therapy are advised against unnecessary exposure to bright light. TMD QDs such as MoS2 QDs may offer a safer alternative to these organic compounds as some transition metals like Mo are themselves essential minerals and can be quickly metabolised after the photodynamic treatment. We will conduct further tests to verify this." Assoc Prof Leong added.